His paintings were usually based on Italian history or Arthurian subjects, often Dante and Beatrix. His most famous paintings include Beata Beatrix, The Girlhood of Mary Virgin, How They Met Themselves, La Ghirlandata, Dante’s Dream, and Proserpine and The Day Dream. Rossetti’s favorite model was Elizabeth Siddal, who he married in 1860. She died of a laudanum overdose in 1862, after the birth of their stillborn daughter. In his grief, he buried a volume of his poetry with her; years later regretting it and enlisting the help of friends to stealthily exhume the coffin and recover the volume. He then used Jane Morris, wife of William Morris as his model, and had an affair with her. Another model, who became his mistress, was Fanny Cornforth. He lived and worked with poet Algernon Charles Swinburne in Chelsea for years. 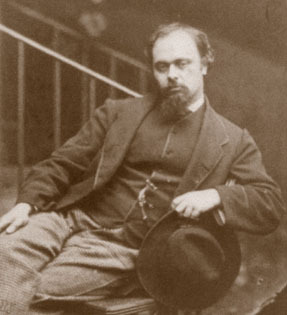 Rossetti developed an addiction to the drug ether. A critic’s attack, in an article called "The Fleshly School of Poetry" was very disturbing to him. He replied to the article with his own entitled "The Stealthy School of Criticism," which only elevated the argument. He became paranoid and depressed, attempting suicide in Scotland in 1872, but recovered. Besides being a painter, he was a poet and writer as well. Some of his best-known poems include The Blessed Damozel and My Sister’s Sleep. This entry was posted on 2010/12/14 by Anemalon. It was filed under Lyrik .